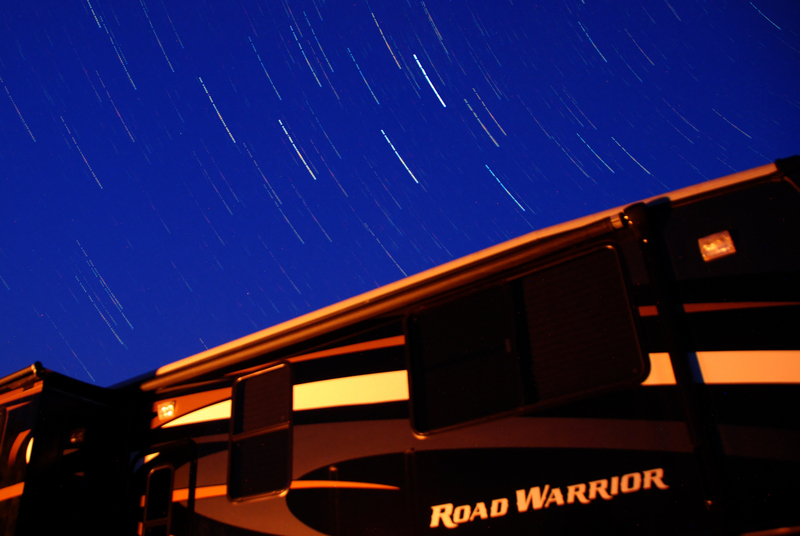 Chances are that if you’re an RVer you have caught yourself being awe struck by the stars in the sky. At times they are so bright, so prominent that they dominate the landscape. This country is full of places where the night sky can take your breathe away and make you think about a higher power or even aliens for some… But how do you capture a moment like that with your camera? 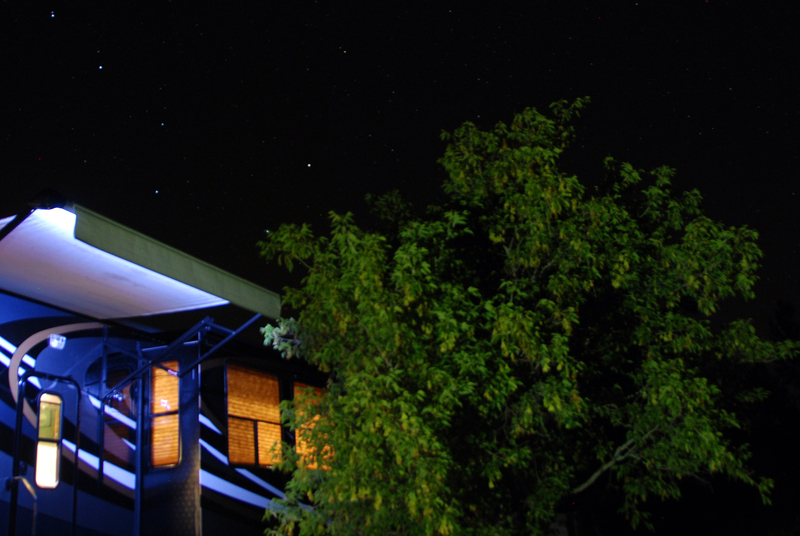 Capturing the stars with a DSLR camera is easier than you may think. 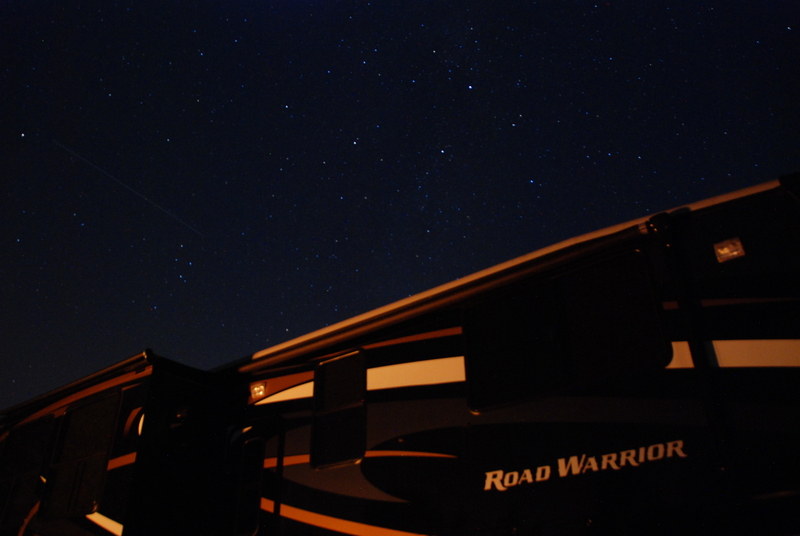 It takes a little knowledge and practice to get fantastic images of your camping experience. Here’s my input on the knowledge, now it’s going to be up to you to practice. It won’t work if you’re near a city. Get out and go camping in the wilderness. The further you are from city lights and the polluted sky the clearer your images will be. You’ll want to check the weather and the moon phase. Clouds cover up the stars and won’t allow you to get you the image you’re looking for. It’s best to capture stars when the moon isn’t in the sky. It’s especially tough to see the milky way when the moon is in the sky. A tripod eliminates camera shake. Without it the stars will be blurry. In fact a tripod is one of the best tools for a photographer. This is where practice and knowing your camera comes into play. With these guidelines you should be able to get a good image, toy around with your settings for maximized results. Mode, the camera must be set to manual mode. Focus, the camera will have a tough time on auto so turn it to manual and set it to infinity. Aperture, I shoot stars at f/4. Keep in mind you want the widest aperture to allow the most amount of light in. 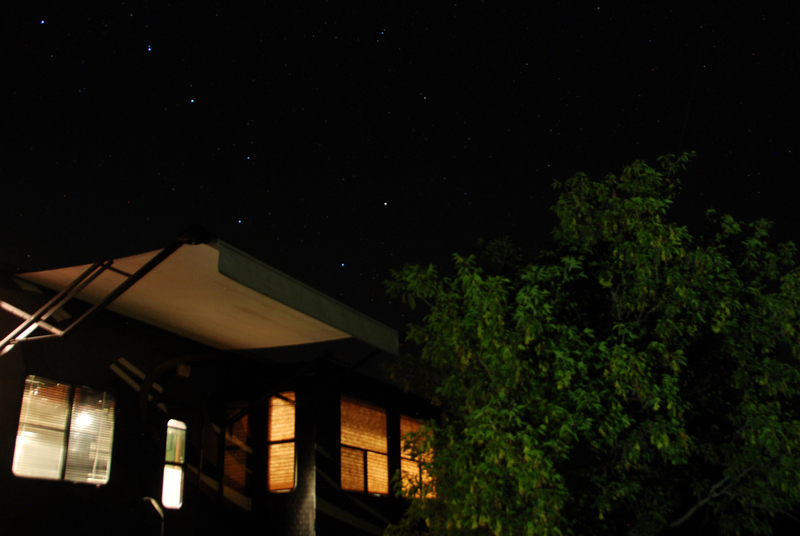 Shutter, the longer the shutter speed the more light will be let in allowing for brighter stars in your pictures. Keep in mind this also will allow other light from other sources. I use a shutter speed of 30 seconds. Anything longer than this and you’ll get star trails from the rotation of the earth. ISO, I use an ISO of 400 but if you don’t get enough light coming in increase it. As you increase the ISO you’ll increase the noise so use the lowest possible while still getting good exposure. Now that you’ve got the basics down it’s time to get a little advanced. To catch a meteor the same settings apply. It’s best to find out when a meteor shower is going to take place. 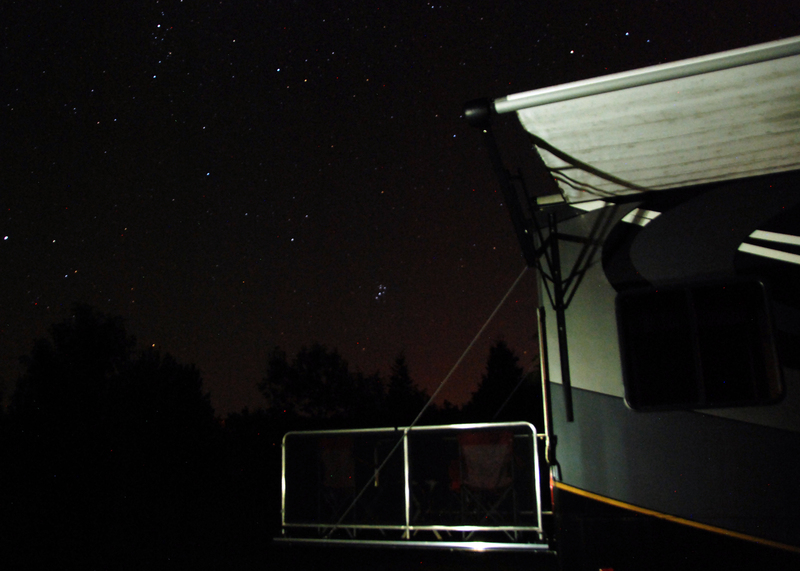 Recently we had the Perseid Meteor Shower. I took a lot of pictures in hopes to catch one. In around thirty pictures six of them had meteors in them. The next two images are essentially identical. The red and blue line in the sky is from a helicopter that flew by but that’s not what I want you to focus on. The tree is lit up in the second picture. The way I did this was to take my iphone and use the flashlight feature to highlight the tree for about 15 seconds of the 30 second shutter speed. If you’ll notice on this picture the awning LED lights are on. I also highlighted the tree with the flashlight as mentioned before. But the challenge was the LED was so powerful that with a 30 second shutter speed it was way too bright and became over exposed. The solution I came up with was to have Danielle turn off the LED lights after just 5 seconds into the shot. Star Trails create amazing images. 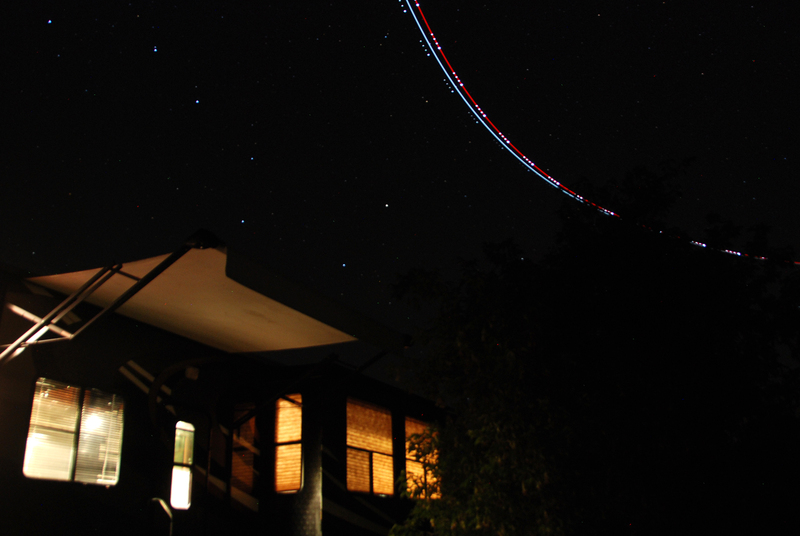 There are two ways to capture star trails. You can use a very long shutter speed, however this creates a lot of noise. The other option is to take a lot of pictures with a 30 second shutter and then to merge them together with computer software. I use free software called StarStax. If you’ve captured any great star images feel free to share on our Facebook Page. We’d love to see them! Now get out and camp!